Here is a cute craft for you and your kids this fall. Who doesn't love collecting pinecones? Collect fall leaves, pine cones, and acorn caps on a nature walk. 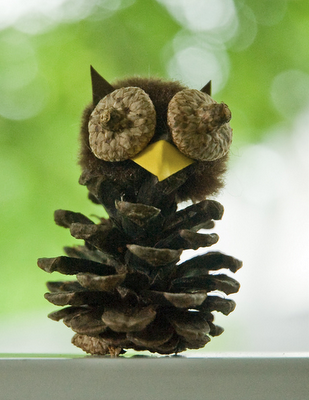 Glue a large pom pom to the top of the pinecone for the head. Cut two tear drop shapes of felt for wings and glue to sides of cone. Cut felt ovals for feet to balance the pine cone. Glue to bottom of cone. Add Fall leaves to create feathers on wings. Glue two acorn caps to the pom pom for eyes. Fold a small piece of yellow paper in half and cut into a diamond shape. Place between the two caps and glue to pom pom for a beak. Cut out two tiny brown triangles for ears. Glue to top of pom pom. I will add wings to my next one! Hope you have fun making these little critters.